On October 3rd, UH’s Friends of Women’s Studies’ Living Archives oral history interview series featured Houston entrepreneur Tina Knowles. 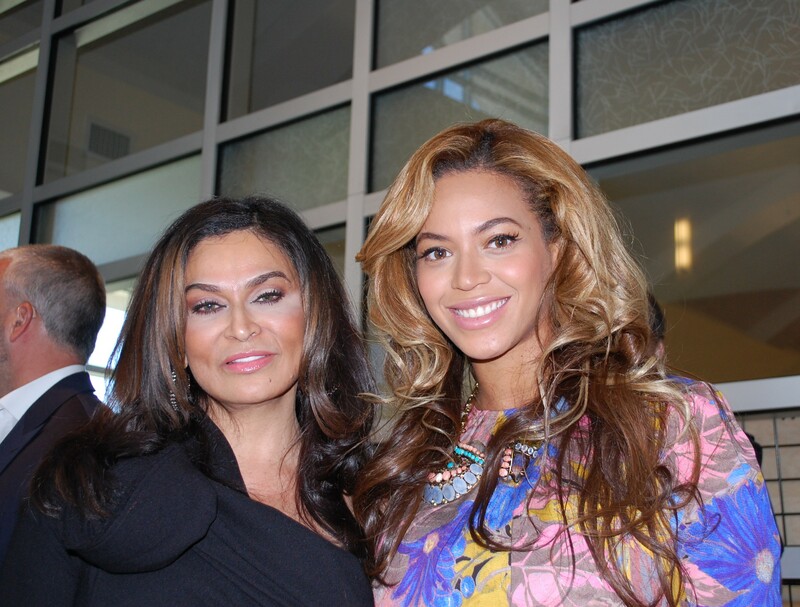 The Headliners salon owner is now in the big time with her Miss Tina and Déreon fashion lines, and she’s designed many outfits for her daughter Beyoncé, the girl band Destiny’s Child, and others. Some of these very cool dresses were on display. There were also a lot of Beyoncés on hand – the star’s first name is also her mom’s maiden name (their roots are in Galveston and Louisiana), and many family members attended, along with some from the Knowles side. When the pregnant Beyoncé joined the audience, a few excited tweets brought hundreds of students to the library, rocking the house. Tina spoke of carrying forward the strength, vision and love of fashion of her seamstress mom Agnez. Likewise, Beyoncé acknowledged her mom’s teachings and example as a source for her own musical focus on independent women and girl power.